Next PostNext What Is Campaign Furniture? 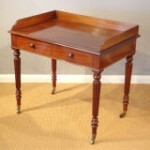 This fine qua lity mahogany side table, dating from about 1840, is stamped ‘Gillows’. Gillows of Lancaster was established by Robert Gillow in 1728 and continued by his two sons. They were a unique firm: no other cabinet makers were in business for so long a period, and no other provincial firms had a showroom and workshop in 18th century London; they were responsible for some of the finest pieces of English cabinet work during the late 18th and early 19th century. They had a wide range of clients, from aristocracy to the merchant classes. All designs were practical and of the best materials, and above all was the quality of craftsmanship: two hundred years later drawers still glide in and out smoothly. The attention to detail in this table is wonderful; the reeded legs are crisply turned, and the drawers reveal a typical Gillows touch: instead of the back edge of the drawer bottom being nailed up into the back, canted slots have been made for the screws, to enable the timber to shrink without the drawer bottom splitting. Extending dining tables were a Gillow invention, and inventiveness and ingenuity characterised their work; the Gillow Archives 1728-1931 are the largest and longest cabinetmakers’ records to have survived in the world.